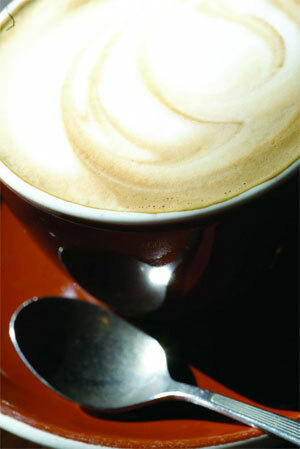 Home » Articles » Diet therapy » Can caffeine fix performance? You only have to view the pile of bikes outside a coffee bar on a Saturday morning to realize that many cyclists are coffee addicts who need their caffeine fix each day. So does caffeine hydrate, dope up or enhance performance? Caffeine is a substance from the methylxanthine family that occurs naturally in the leaves, nuts and seeds of a number of plants. Major dietary sources of caffeine, such as tea, coffee, chocolate and cola drinks typically provide 30-100 mg of caffeine per serve, while some non-prescriptive medications contain 100 -200 mg of caffeine per tablet. The recent introduction of caffeine (or guarana) to ‘energy drinks’, confectionery and sports foods/supplements has increased the opportunities for athletes to consume caffeine, either as part of their everyday diet or for specific use as an ergogenic (performance enhancing)aid. ref Table 1. In 1 January 2004, caffeine was removed from the 2004 World Anti-Doping Agency Prohibited List, allowing athletes who compete in sports that are compliant with the WADA code to consume caffeine, within their usual diets or for specific purposes of performance, without fear of sanctions. It was recognised that caffeine is metabolised at very different rates in individuals with associated wide-ranging effects. Currently caffeine is only on WADA’s monitoring program in order to detect patterns of misuse in sport and it is worth noting that the 2010-11 program recorded a significant increase in the amount of caffeine consumed by athletes. Originally it was thought that caffeine enhanced endurance performance because it promoted an increase in the utilisation of fat as an exercise fuel thereby ‘sparing’ the use of the limited muscle stores of glucose (glycogen) for later in the race. In fact, studies now show that the effect of caffeine on ‘glycogen sparing’ during sub-maximal exercise is short-lived and inconsistent – not all athletes respond in this way. Therefore, it is unlikely to explain the enhancement of exercise capacity and performance seen in prolonged continuous events and exercise regimes. It was also believed that caffeine-containing drinks have a diuretic effect and cause an athlete to become dehydrated. However it is now thought that caffeine-containing drinks such as tea, coffee and cola drinks provide a significant source of fluid in the everyday diets of many people and any effect of caffeine on urine losses is minor – particularly in people who are habitual caffeine users. It is now thought that the main benefit is caffeine’s ability to bind to adenosine receptors that help regulate many physiological, neurological and immunological processes which may lead to a reduced perception of effort or fatigue. Caffeine may have a direct effect on the circulatory system and also skeletal muscle before and after fatigue as demonstrated by electrical stimulation. In the past caffeine was taken one hour before an event in doses equivalent to 6mg/kg of body weight (around 300-500mg per athlete). Evidence from recent studies involving prolonged exercise lasting 60 minutes or longer have found benefit at lower levels 1-3mg/kg (approx. 70-200mg per athlete) when caffeine is taken at a variety of times ( before, during or towards the end of the event) particularly when the athlete is noticing fatigue. There is no dose-response relationship to caffeine, as everybody responds to it differently and taking more does not lead to increased performance. While caffeine withdrawal symptoms can be unpleasant reducing caffeine intake itself does not lead to a reduction in the performance enhancing effects of caffeine on endurance exercise. So athelete’s are advised to use the lowest levels possible. Withdrawal symptoms can be minimized by slowly reducing caffeine consumption over several days. Which sports benefit the most? Prolonged intermittent, high intensity e.g. team and racquet sports. In the short-term, urine production at rest may increase as a result of initial caffeine introduction. However for habitual drinkers, caffeine is unlikely to alter fluid balance or lead to dehydration. Also for many people who consume tea, coffee and caffeine drink’s regularly these drinks may contribute significant levels of fluid to their daily fluid intake. If taken in excess, caffeine can increase heart rate, impair or alter fine motor control and technique which may interfere with recovery (from training and competition) and sleep patterns which could upset concentration and precision. Caffeine can interfere with the actions of other supplements an athlete may be taking. For instance caffeine can inhibit the ability of creatine monohydrate to store calcium in the muscle thereby reducing its effectiveness to help the athlete to build strength and power. Although research is yet to establish a safe level for caffeine it is not recommended for use by children and adolescents taking part in sport, particularly on hot days. Also for adults the long-term intake of large amounts of caffeine (>500mg per day) is generally discouraged by health authorities. No clear evidence has been able to prove that coffee increases the risk of hypertension, myocardial infarction or other cardiovascular disease. However research both green and black tea is hopeful. The flavonol content of tea has been associated with lower coronary risk. Tea appears to improve the vascular epithelium and affect homocysteine, cholesterol, LDL oxidation and atherogenesis. Type 2 diabetes is now being investigated with coffee rather than tea offering evidence of some protection. If you would like to discuss your caffeine consumption with us then contact us today.